Sunsets on Thursdays — where will you be? The community park of course! June 26: Penticton Concert Band: Repertoire includes the soundtrack of Gladiator, Irish music from Lord of the Dance, classic rock (Beatles, Queen), and even some disco! Who knows? Maybe a little big band jazz and classics, thrown in. You name it, they play it. And how! July 3: Nankama Drum and Dance: With Bobby Bovenzi firing up the crowd, can you say “audience involvement”? You won’t be able to stop tapping along to these funky West African rhythms and moves. Drums for everyone! July 17: Aidan Mayes and Mandy Cole: Sweet soulful harmonies from these stars of Soundstage Penticton’s Les Miz. Contestants in CBC Searchlight with a new CD in the works. Big voices, beautiful sound. July 24: Steve Jones and the Patio Bandits: This classic rock’n’roll band keeps the oldies going with Eagles and Beatles covers, and mix it up with some originals. This is our FEED THE VALLEY Concert, sponsored by Valley First Credit Union. 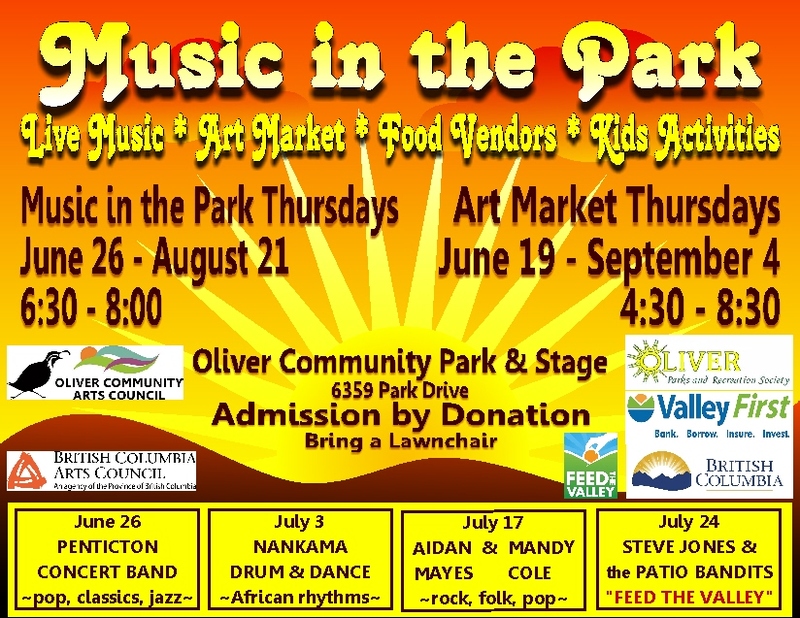 Along with your concert donation, please bring canned and dry goods for the Oliver Food Bank. August 7: Andi Zack and Ken Johnson are home on holiday from Nashville. Andi has a new tune on the country charts to share with you. Welcome home this small-town girl dun good! August 14: Rising Stars Two emerging talents making names for themselves! Kansas Lee Hatherly, CBC Searchlight singer-songwriter from Osoyoos. Matthew Thomas of Oliver, plays keyboard and vocals. August 21: Jazz Out West: Iris Larratt’s gorgeous, smooth vocals on all the big ballads and jazz standards. Each year is a different musical theme. Backed by handsome gents Jim Wyse, Bob Park, and Bob Larratt. The action starts at 4:30 p.m. Come early for the art market and food vendors.Let the kids cool off in the public pool while you’re at it. Bring a lawnchair or blanket for your picnic supper. At 6:30, sit back and enjoy the 90 minute concert. Don’t forget to make a donation! Then meander your way home past the market vendors, staying open until 8:30 p.m. It’s just another perfect sunset in Oliver! Bookmarks coming soon! Pick yours up starting June 23 at the Tourist Information Centre at the historic CPR Station, or at every concert.